I may owe Eckhart Tolle an apology. I haven’t decided yet. I still fall asleep if I read more than 3 pages of The Power of Now at a time but the dreams, they are peaceful. I’m kidding (sort of), but people I respect recommend this book – people who have opened their hearts and minds to new ideas that I have shared so maybe I owe them, and maybe I’ll learn something, if I can just shed my automatic and cynical revulsion towards New Age vocabulary. I’m not sure why, but I resist terms like “self-actualisation” and the expression “inner peace” creates for me an inner storm of bitter and sarcastic retorts. Yet, I envy the lifestyle and secretly want for myself the calm these crazies claim to have achieved. For Christmas this year, I received Elizabeth Gilbert’s Eat, Pray, Love. I had already seen the movie and didn’t find Julia Roberts’ character to be particularly likeable. And I felt the same about the book really, except again for the envy and attraction to the lifestyle that this woman experimented with for a year. How nice for you, I thought, that you could take a year off to run away from everything you had screwed up for yourself and a publisher was basically going to pay for your pursuit of pleasure and … see the bitter, jealous side of me bursting out? I wish someone would pay ME to do that. I want to hang out in Bali and learn how to meditate in an Ashram in India. I would even settle for a weekend retreat at the Buddhist center near my house. So, at the same time I’m thinking about all of this, I’ve just come from the ALA’s Midwinter Meeting in San Diego where I did not find a job, but got a lot of useful advice about job hunting. I’ve even come up with a quarter-of-a-million dollar idea, that I don’t think will make me rich, but might take my career in a new direction assuming I don’t lose interest. 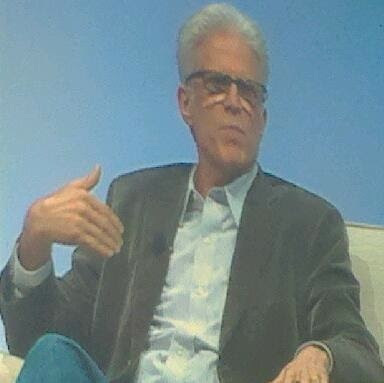 The key-note speaker at this conference was, of all people, Ted Danson (promoting his book Oceana) and he summed up his interview with a brief explanation of his belief in the Law of Attraction (another theory I have both dismissed and secretly been drawn to) and how any changes we might want to see in the world or in ourselves must be approached from a positive angle, from a place of joy and delight instead of fear or disgust. Fear and Disgust have always fueled my sense of humor (in which I take joy and delight) but I recognize truth in Mr. Danson’s words. And Mr. Tolle said (just before I fell asleep) something about how he wasn’t saying anything new in his books, instead was just reminding us of truths we had forgotten. What surprises me is that I am actually open to these ideas. Maybe it’s a developmental stage. In both Tolle and Gilbert’s books they were roughly my age when the desire to make a profound, spiritual change came over them. Maybe that explains why I felt drawn back to Church. I’m not looking for God really, I just need to calm the hell down and learn to sit quietly by myself. That’s the appeal: To learn something about myself that I’ve forgotten that I always knew. I'm including this picture because I have it on my phone.